elobeatlesforever: Quill & Bev Bevan Double Date Soon! Quill & Bev Bevan Double Date Soon! Hello ... Hello ... my old friends ... It's great to see you once again! 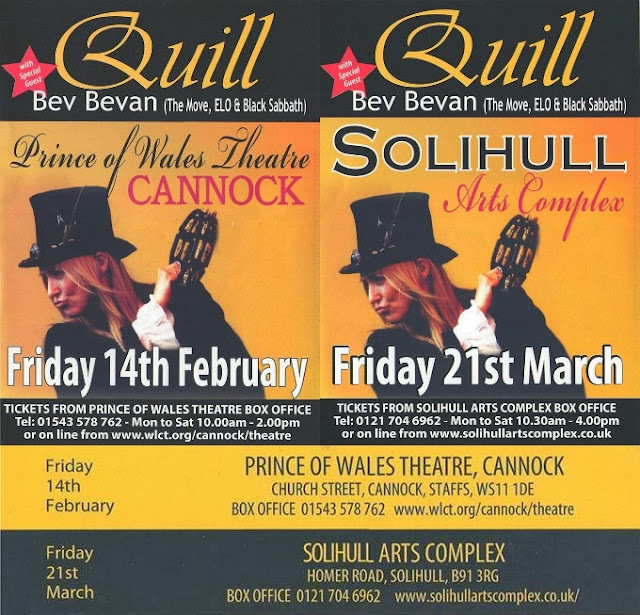 Don't forget that Quill are teaming up with Bev Bevan [The Move, ELO, ELO Part II, Black Sabbath] for two very special forthcoming gigs on Friday 14th February in Cannock and Friday 21st March in Solihull. This ELOBF gig review of their fantastic show last October in Lichfield with Bev Bevan guesting on percussion will [hopefully] whet your appetite for either or both gigs. Ticket sales for both events are healthy so don't delay in booking your seat[s] lest you miss out on a great night of Celtic-tinged music! ELO Beatles Forever [ELOBF] recommends Quill to those enlightened folks who enjoy the music of ELO, Jeff Lynne, Roy Wood, The Move, The Idle Race, 'Brum Beat', The Beatles and related artistes. The Orchestra: Three UK Dates Soon!